CLEVELAND – Kevin Love won’t be able to help LeBron James and the Cavaliers in Game 7 against the Celtics. Love was placed in the NBA’s concussion protocol and the All-Star forward will miss Sunday’s series finale of the Eastern Conference finals, a personal blow and yet another challenge for Cleveland to overcome. 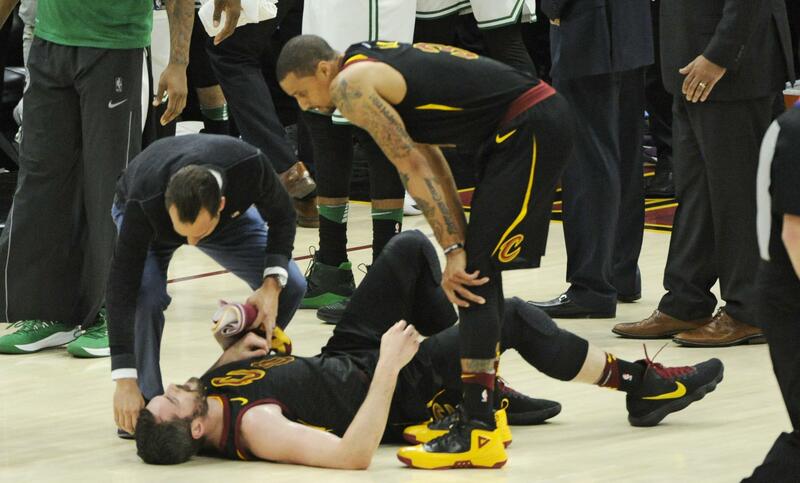 The Cavaliers said Love, who inadvertently bashed heads with Celtics rookie Jayson Tatum in the first quarter of Game 6, experienced concussion-like symptoms Saturday before the team’s flight to Boston. Moments before the Cavs sent a news release updating Love’s status, coach Tyronn Lue held a confusing teleconference during which he said the 29-year-old was still being evaluated and there was a possibility he could play. Love is averaging 13.9 points and 10.0 rebounds in 17 playoff starts, and he’s the No. 2 scoring option for the Cavs, who have leaned on James harder than ever this postseason. There is statistical data to support that the Cavaliers have been more effective in the series when Love has been out. But while Cleveland may be better defensively, Love’s shot-making ability helps the Cavs spread the floor and open driving lanes for James. James scored 46 points in Friday’s victory, his latest jaw-dropping performance in what has been perhaps the greatest postseason of the superstar’s storied career. James is averaging 33.9 points, 8.9 rebounds and 8.8 assists and has had seven 40-point games and two-buzzer beaters. The 33-year-old’s next challenge: finding a way to beat the Celtics, who have played at another level on their home floor. It’s interesting that as James tries to advance to his eighth straight NBA Finals – a feat accomplished only by legendary Celtics center Bill Russell and three other Boston players – that Love will be in street clothes on Cleveland’s bench and Kyrie Irving will be sitting on Boston’s. The Cavs relented to Irving’s request and traded him to the Celtics last summer, but the All-Star point guard didn’t play in this postseason after undergoing knee surgery. At one time, James, Irving and Love comprised Cleveland’s “Big 3,” a power trio that won an NBA championship together and went to three straight Finals before fracturing. Lue said he wasn’t concerned about James, who favored his leg while slowly walking out of Quicken Loans Arena early Saturday after Game 6. Love has suffered at least two other known concussions in his career – one that kept him out of Game 3 in the 2016 NBA Finals. He also missed a game at Charlotte on March 28 with a head injury. Love missed the majority of Cleveland’s 2015 run to the Finals after separating his shoulder in the first round against Boston. Published: May 26, 2018, 11:21 a.m. Updated: May 26, 2018, 1:18 p.m.